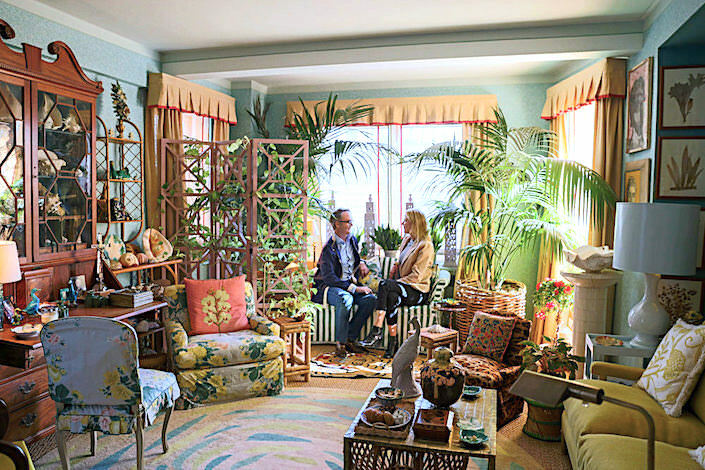 In a bland box of a lower Park Avenue pre-war, designer Frank de Biasi and partner, fashion and textile designer Gene Meyer, have fearlessly transformed their high rise rental into a personal, maximalist space. Timidity has no place here as family heirlooms, treasured collections and inventive decorative treatments live together in layered idiosyncratic harmony. 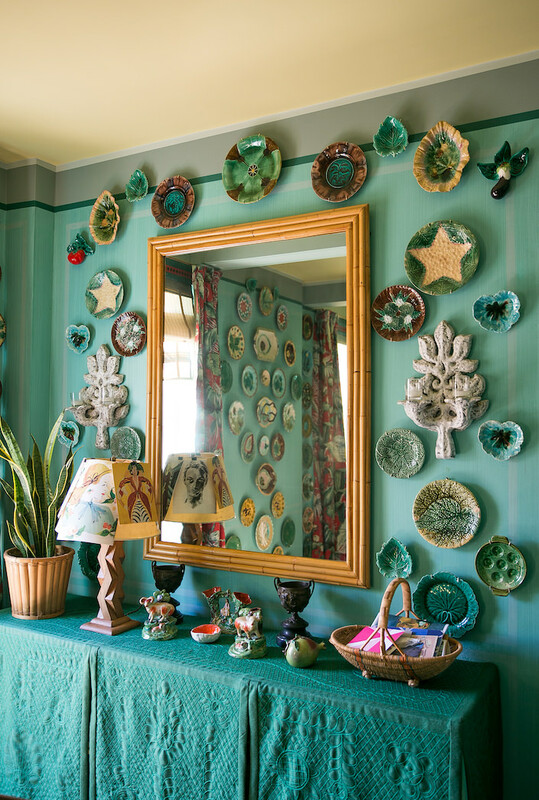 Tag along with Susanna Salk and me to the inspiring home of these two creative talents. While some may be reticent to so lavishly embellish a rental apartment, Frank never held back in designing an imaginative backdrop for his and Gene’s art filled rooms. Clever visual solutions and an elevated-meets-eccentric aesthetic yields an apartment brimming with personality and a distinctive narrative. After years at Christie’s in the Estates and Appraisals department followed by twelve years as Director of Interiors at Peter Marino, Frank has an educated eye that allows him to mix unexpected combinations with ease. Whether an inherited antique, portrait by Gene or bespoke contemporary piece, it all works with a personal and artistic flair. Whether you live in a castle or cottage, there are inspiring ideas galore here you could translate for your own. So thank you Frank and Gene! We are thrilled to be able to share your many talents and ebullient home! This entry posted in architecture, art, At Home with, furniture, interior design, Quintessence video series, Stylish Shopping, video. 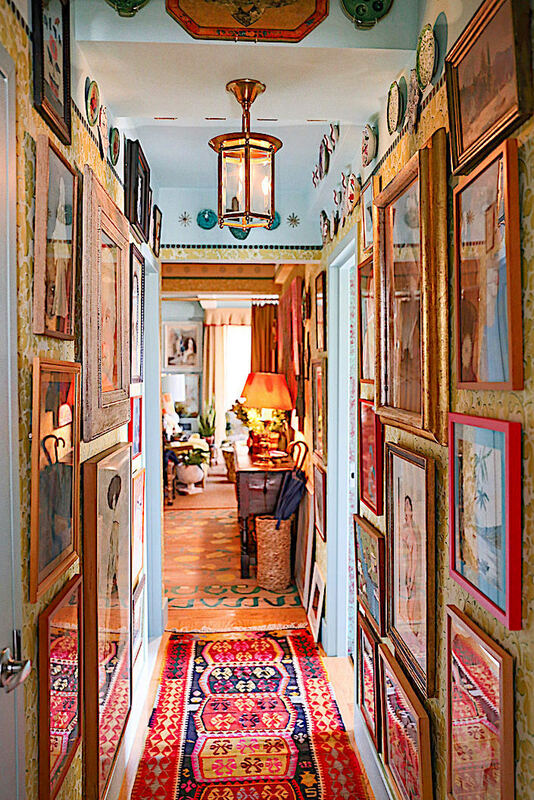 Entry Tags: At Home with, Decorating, Frank de Biasi, Gene Meyer, home tour, interior design, NYC luxury apartments, Video Bookmark the permalink. LOVED this one SO MUCH! I could have looked for hours. Bravo! No better description than Susanna’s concluding remark, “You make it feel like a whole other world here.” Thank you for a glimpse into this beautiful world Stacey and Susanna ! Special and beautiful apartment, and, even more importantly, a really nice guy. Love! You both continue to do the most overthe top designing. directions, sky is the limit.BRAVO!It is great you you enjoy your freedom. I LOVE IT. Absolute perfection! Such an inspiring space full of special pieces. 83 queries in 0.680 seconds.